Using a food processor, pulse the flour, sugar and salt together until well combined. Add in the cold cubed butter and pulse until it resembles the size of peas. Slowing drizzle in half of the iced water and pulse until the mixture is moist and crumbly. Transfer the crumbs onto a clean working surface dusted lightly with some flour. Use your hands to bring it together to form a ball. Add more flour onto the surface or dough if necessary to prevent sticking. Pat into a round disk and use a rolling pin to roll it into an 8 – 10 inches circle. Transfer the crust onto a baking tray lined with non-stick baking paper and refrigerate it while you work on the filling. Peel and remove the core of the apples. Slice them thinly (approx. ⅛ inch thick) and place into a large bowl. Add in melted butter, vanilla, cinnamon, sugar and salt and mix well. Take out the crust from the fridge and sprinkle 1 tbsp flour on the centre and spread it evenly. Arrange the apple slices neatly in the centre of the crust, leaving about 3 inches from the edge. Fold the edges over the apples, leaving the centre uncovered. It does not need to look perfect. If the edges are tearing, pinch some dough from the edges of the dough and patch it up. Brush the beaten egg all over the edges and sprinkle raw cane sugar evenly all over the crust. Chill in the fridge for 20 – 30 mins before baking. Meanwhile, preheat your oven to 350°F/180°C. Bake for 50 – 55 mins until the crust is golden and apples soft. Do not worry about if some of the juice leaks out from the tart and the burnt bits. Simply scrape them off after it is done. When the tart is done, allow to cool for 5 minutes before transferring it together with the baking paper onto a cooling rack. Brush some corn syrup all over the apples to create a nice glaze (optional). 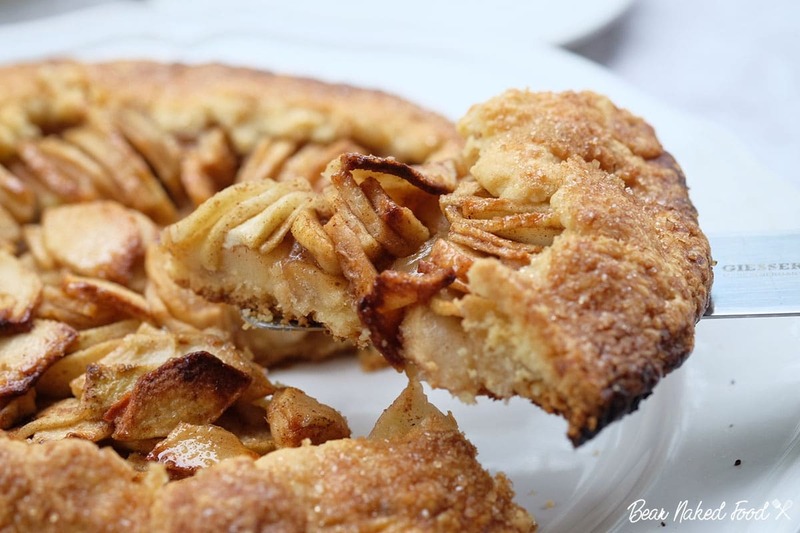 Transfer the apple tart onto a large plate and serve with some vanilla ice cream on the side. Cover leftover with a cling wrap and let it at room temperature for a couple of days.